There has been a lot of talk in the news about the plight of college graduates saddled with debt concluding that a college education doesn't pay. In this article, lets take a look at whether education pays. According to the Department of Education, the average student graduates with approximately $24,000 in student loans. The projected interest rates for student loans may top 6% in 2012-2013 year, so lets use 6% as an estimate. At 6% interest, I am going to have a payment on a 10 year repayment plan (assuming I am average) of $266.45 monthly. That's a lot of eating out I will have to bypass to make my payments! Let's see for $266 I could have a car payment, buy some awesome new clothes AND have a great phone plan with all the data I can stand! But here's the thing.... According to the Census Bureau, the difference in my average salary will likely be 65% more after graduating with a 4 year degree compared with a High School diploma (20% higher for an Associates degree). That means that even though I am paying $266.45 in student loan payments I can earn $4,563 per month. That is almost $1,800 more than I would have earned without the degree. CAUTION: Averages are just that. There are a lot of factors that come into play as you consider how much you can earn. Some are factors you can control like your professional appearance, your work habits, your prior experience, the type of work you have chosen. (Some service professions are grossly underpaid compared with their corporate counterparts). There are other factors you can't control like the unemployment rates, the location of the employer etc. Your best bet is to focus on the controllable factors and set yourself apart as the primo candidate the employer would love to hire. But overall, does education pay? You bet! Getting started on a spending plan doesn't have to be hard, it just takes a little bit of planning and a whole lot of honesty. Many of us know where the big money goes - rent, car, doctor, etc. The trouble we have is knowing how to find all those smaller dollars that seem to evaporate into thin air if we are not watching their every move. Did you see that last one? Kind of sneaked that one in on you! Savings should be a part of everyone's regular spending plan if they are moving forward and not backward. Emergency savings first and then longer term savings. For these expenses do your best to estimate the total cost for last year and then divide by 12. That is how much you should be saving each month for these items. Even if the expense is not for several months away, continue to save it in a safe location (like a savings account you will not touch) until the expense is due. Step 3: Search out the spending leaks. Leaks are any expenses for which you do not have a planned allocation. Often we lump them into "miscellaneous" but if we are to control our cash and not have our budget control us, we need to know where all our money goes. For these expenses, use a method that works for you, envelope, receipts, ledger (you can find some of these methods in the resource section of this blog). Write down every penny spent so that you can evaluate how much is really necessary and how much is discretionary. It may take a couple of months to find all the leaks in your spending plan, but as you plug the leaks and make a plan for the necessary spending you will find yourself in control and feeling good! Many of you Bank On participants have heard about Virginia Saves and have even made a commitment to savings but did you know that Virginia Saves is on a mission to help you enjoy life to the fullest and still stay on track with your savings goals for the future? Plan for the vacation of your dreams without havings to rob Peter! Find creative ways for making fun at home and away this summer. Vacation can be one of those budget busters that throw us off our best laid cash management plans. 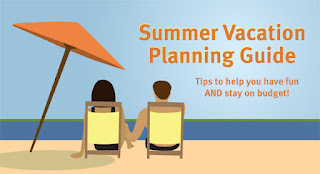 Without a sound plan to pay for vacation costs, you can find yourself farther behind in your financial plan than when you started, but with a little planning you can enjoy summertime fun and still have money for your other monthly expenses. 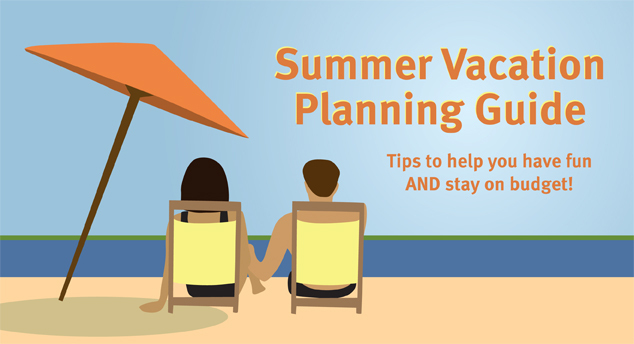 The Vacation Planning Guide offers worksheets to help you break down vacation costs and engage the entire family in planning for the big event. You may find that planning your big get away can be almost as fun as the destination when the whole family is involved! The Federal Reserve Board has recently announced that if you believe that you were financially harmed during a mortgage foreclosure process from 2009 - 2010 by major mortgage providers, you may request an independent review and potentially receive compensation for the damages you incurred. Balance at foreclosure was more than you actually owed. Foreclosure action occured on mortgage obtained before active duty military service while servicemembers was covered by Servicemembers Civil Relief Act. Visit https://independentforeclosurereview.com or call 888-952-9105 to request help completing the form you have received in the mail. You must request this independent review on or before July 31, 2012.